The majority of companies have a difficult time deploying NAC across the enterprise. No existing NAC solution provides access control for all endpoints and operating systems – leaving vulnerable blind spots on the network. Some company leaders spend hundreds of thousands – even millions – of dollars on a NAC solution only to spend years trying to implement the technology. As a result, this can turn into a very frustrating process. However, the solution intended to help you better secure and manage your network shouldn’t wind up creating greater risk and chaos. There are ways to set your network and your team up for success. 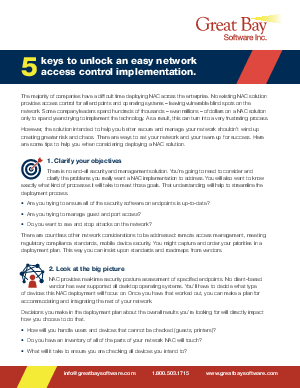 Here are some tips to help you when considering deploying a NAC solution.